If You Write It, They Will Publish...Won't They? "If you build it, they will come." That line is from the movie, Field Of Dreams. A voice tells an Iowa corn farmer to build a baseball diamond. He does, and the ghosts of the Chicago "Black Sox" team appear. It's a great film, and the line has become a standard. Try a Google search and see how many people have adopted it for their own purposes. But this post isn't about baseball or movies. It's about respect for your writing. How do you answer the question, "How are you coming with your writing?" I've been getting that a lot recently. I guess I could say, "I've written three novels, had some compliments on my writing, been encouraged by interest from publishers, but nobody has offered to publish them." But what they really want to know, I've found, is when they can look for something of mine on the front table at Barnes & Noble. And I think the chances of that are somewhere north of "slim to none." When folks find out that I'm writing, the common feeling seems to be that "If you write it, they will publish." So, if the novel is finished, when is it coming out? Most of you reading this are also writers, and you know that this perception is far from accurate. When I first started out trying to find a publisher for The Tender Scar: Life After The Death Of A Spouse, I had the idea that you just stood on the street corner and waved your manuscript, waiting to flag down a publisher as you would a taxi. I've since had quite an education--almost a postgraduate degree by now--in the process, and it's not that simple. My answer to the "How are you coming along?" question has evolved into this: "I've finished three novels, started on the fourth, and am working on another non-fiction book." Then I load up to answer the inevitable question that follows. "No, I don't have a contract yet." I've stopped explaining that I'm not writing for the thrill of seeing my words in print. I don't write because I'm anxious for an economic windfall. I write because I feel called to do it. Just as baseball players--the ones struggling in the minors for peanuts, not the fat cats drawing obscene money in the big leagues--just as baseball players will tell you that they play because they love the game, I'll tell you that I write because it's a part of me. It's changed me over the past three years, changed me for the better. And maybe that's all it's meant to do. A recent survey by the Barna Group compared the characteristics of atheists and agnostics with those who classify themselves as Christian. Looking at the whole study, it appears that the percentage of persons with no personal faith is increasing very slightly with the passage of time--that is, compared with figures of several years ago, there are more atheists (by a slim margin). As I look at the figures below, it appears to me that as people age, they embrace (or return to) Christianity. Here are the figures as given by the Barna Group. Current age is followed by the % atheist/agnostic. The survey is worth reading, and I won’t list all the conclusions here. It is noteworthy that there’s no difference between the non-faith group and Christians as regard a number of issues, including problems with serious debt and personal addiction. I have no explanation for the fact that 41% of Christians characterized themselves as overweight, whereas only 26% of atheists and agnostics fell into this category. I could guess, but it probably would get me in trouble the next time our Baptist church has a pot-luck dinner. The most telling difference was in the area of stress and peace. Only 37% of the non-faith group were “stressed out,” while 26% of Christians admitted to this problem. Overall, 90% of Christians felt at peace most of the time, while the number dropped to 67% for atheists and agnostics. There’s a very disconcerting thing mentioned in the Barna article: “The new evangelists are atheists.” People who have determined there is no God or who doubt his existence are adopting a more aggressive, intentional effort to discredit the notion that God exists and to critique people of faith. We can see this in the attention directed toward books such as The God Delusion and God is Not Great. As a matter of fact, many “Christian” non-fiction books are now directed toward rebutting these best-sellers. Bottom line: there will always be those who doubt the faith that we embrace. We have two choices. We can snuggle down under the covers, content in our belief, or we can let the world know what we believe and why—not by carrying signs and shouting, but by the quiet witness of our words and deeds. I’m glad to be in the group that counts God as our father. I hope you are, as well. I've just read The First Five Pages: A Writer's Guide To Staying Out of the Rejection Pile, by Noah Lukeman. Lukeman is an extremely successful agent, and if you don't believe it, look at his client list. By the way...he's not taking on any new authors. I really enjoyed his book, A Dash Of Style, which I found to be the most entertaining and useful book on punctuation I've ever read. That's right, an entertaining book on punctuation. Lukeman shows how a writer can use punctuation to change the presentation of the written word in the same way a composer can use musical shading and tempo. I highly recommend the book. Honestly, I didn't find The First Five Pages to be as entertaining as Lukeman's other book, but it certainly has helpful information throughout it. He begins with the absolute imperatives, the things an agent or editor looks for as they work their way through a stack of proposals and manuscripts, always looking for a reason to discard the work and move to the next one. That's what they do, by the way. They have plenty of submissions. They're panning for the gold, and if there are iron pyrites in the sample, out it goes. Lukeman begins with a discussion of presentation: the way in which the material is written, printed, presented. If it's sloppily done, that's pretty much an automatic rejection. He cites one exception: a manuscript, done on a dot-matrix printer, worn and dog-eared, with a tiny sticky note attached, apologizing for the condition but explaining that the author was a prisoner, and making new copies was next to impossible. But unless you're doing five to ten somewhere as a guest of the state, I suggest a laser or inkjet printer and twenty pound bond. Then he talks about the dreaded adjectives and adverbs. I'm neutral on the subject, myself. I don't try to hunt them down and kill them, but I do search for ways to show the description through my choice of verbs and nouns. If you write with this in mind, you'll end up with stronger prose. Lukeman has an excellent presentation on all this. I'm not going to give you all the material Lukeman presents. Just like any author, he wants to sell the book, and you should buy your own copy. And don't ask to borrow mine--it's in the bookshelf in my office, replete with yellow highlighted passages and sticky notes. There are many books that I've found helpful in honing my craft. I won't detail them all--I've done some of that in previous posts, and will do more at another time. But to that list, let me hasten to add The First Five Pages. "I'm sorry, Mr. Kipling, but you just don't know how to use the English language." For those of you who were worried about it (all three or four of you), I'm back writing again. That doesn't mean that I'm happy about the misfortune of some of my friends. It certainly doesn't signify that I'm pleased with a couple of rejections I've received lately, including one from a publisher who'd given me every hope that we were nearing an accommodation. But life goes on, and I'm back polishing novel number three and putting the finishing touches on a proposal for another non-fiction book. 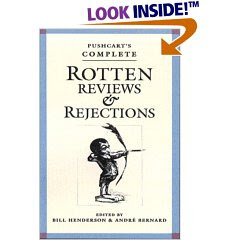 Meanwhile, I've found a number of really neat quotations about other writers who've been rejected, the best of which I've chosen as the title for this post. That one's taken from a book, Pushcart's Complete Rotten Reviews and Rejections. I recommend that you keep it by your computer and refer to it every time an editor sends you one of those notices--especially when it's the dreaded form letter. Another quotation that does my heart good is attributed to Joseph Hansen: "I have never had a book, story or poem rejected that was not later published. If you know what you are doing, eventually you will run into an editor who knows what he/she is doing. It may take years, but never give up." Did you notice that? Maybe the editor who sent the rejection notice didn't know what he/she was doing. One final story. An editor told me this when the pub board of his house declined to publish a novel I'd submitted and which he liked. "Of course, this is also the group that rejected the Left Behind series." Take heart, fellow writers. It may not be your fault. Of course, it may be our fault, which is why my next post will have tips for writing from an expert. This is a special weekend for me. It reminds me of the awesome responsibility I have as a father, but it also allows me to reflect on the joys that role has brought me. My Dad has been gone for over three years now. He modeled a number of things for me. Everyone in my home town knew that George Mabry's word was as good as gold. When someone needed help, he was there. He worked hard to provide for his family. And there was never a time in my life that I doubted that he loved me. Those are the values I want to pass on to my own children. Of course, Dad had his shortcomings, as well, among them a tendency to be a bit impatient. 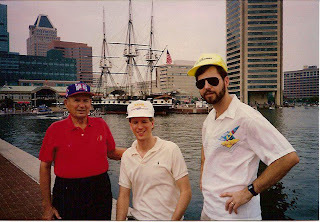 But it was worth putting up with the faults to enjoy his company, like the time when Dad and I joined my two sons in Baltimore to see a Texas Ranger game (pictured above). Or when he and I played golf together at the Doral Club in Florida. We had some great times. Maybe what I remember most were the times Dad would come home bone-tired from a hard day of work. I'm sure all he wanted to do was just collapse. Instead, he picked up the worn catcher's mitt and walked with me out to the spot in the yard, a measured sixty feet, six inches, marked by a cardboard replica of a pitcher's rubber and another cardboard cutout representing a home plate. I'd take my position and do my very best Carl Erskine imitation, and he'd compliment me on my improvement. I never made it to the Big Leagues, but playing catch with my Dad remains one of the best memories I have. Thanks, Dad. I've already received appropriate remembrances from my own children for Father's Day, and I'm touched by each of them. I've tried hard to model for them the same kind of values my Dad did for me. And I've made it a point to spend time with each of them, even when it wasn't easy to arrange. But I know that they have the right kind of value system, that their word is good, that they do their best at everything and always are ready to help others, and especially that God is a daily part of their lives--so I guess I haven't been too bad a father. I've been sort of down about my writing recently. Is it even worth the effort to try to shape up the first draft of novel number three, considering the increasing difficulties of an unpublished fiction author getting a contract in the Christian publishing market? There's a non-fiction book I should be working on, but recently it's been hard to concentrate on writing, and especially on a subject that has some tough emotions associated with it. There's been a lot of sadness in our lives the past couple of weeks. Funerals, friends battling terminal cancer...when you reach our age, that's to be expected. So instead of writing, I'm more inclined to enjoy life a bit. And that's what I've been doing. 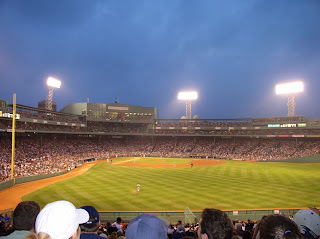 We made the trek to Boston for the wedding of the daughter of some good friends, and found time to take in a game at Fenway Park (above--the Red Sox beat the Yankees). I played golf today with a friend who needed the time for relaxation. My wife and I watched some reruns of Frasier and laughed a lot. I'll get back to writing in a few days. But for now, I'm going to enjoy my family, try to minister to my friends who are hurting, and pray that God can use me each day in one way or another...even if it's not writing. "How Do You Get To Carnegie Hall?" Same answer. (click here for rim shot—supply your own groan). I’ve been in writing groups with authors who have been reshaping, rewriting, and refining the same novel for years, trying to get it published. I can’t criticize that—I’ve done the same thing with both my completed novels—but I have noticed that the structure of my third novel (almost finished in first draft form) is much better than that of either of my first two. And I think it will take less work to refine it than was necessary with the others. In other words, my practice may be paying off. If you’ve completed one novel, you’ve really accomplished something. If you have two of them finished, congratulations are in order—whether you’re ever published. But by the time you’ve gone through the mental discipline required to put together three novels, you should automatically be checking for point of view shift, unclear statements, excessive use of adverbs, and all the other things that shouldn't mar your writing. Your practice will be showing. So, if you’ll excuse me, I’m going to sign off and get back to practicing—I mean, writing. I've had some rejections of my first novel in the past few days. Rather than slashing my wrist or heading for the Valium bottle, I re-read a past posting by Ray Rhamey, at his site, Flogging The Quill. It made me smile, while nodding my head at the kernel of truth it contained. Here, with Ray's permission, is the post. Let me know what you think. "He trashed my novel" is what a writer said to me about an editor he’d paid for a critique. He felt badly about it. Sure he did, considering how much work and heart goes into writing a novel. Then he paid a second editor to edit his book. She started but soon declared that she couldn’t continue with it. The writer was feeling defensive and picked on, so I volunteered to take a look at a sample. Well, I did, and I’m now trying to figure out how to deliver an honest critique in a way that won’t make him feel “trashed” again. I’m a novelist as well as an editor, and I feel strongly that I should help him understand the shortcomings in his narrative. But it’s a form of rejection, hard to do and hard to take. I’ve been on the receiving end of bad reviews from agents and critique group members, and I’m sure of one thing: we—writers, editors, and agents—need to do a better job of give and take. Writers need to understand that rejection is not about THE PERSON. Nope. It’s about THE WORK. If you grow a pumpkin that turns out undersized and someone points out that fact, it's not personal, it's about the pumpkin. To take rejection personally is to miss an opportunity to be saved from a mistake. I was in the ad business for a ton of years and everything I did was critiqued with close, hard looks because money was riding on every idea, every word--and the same is true in publishing. I learned a lesson that has served me well—if someone questions (i.e. rejects) my work, there’s a 50% chance I’m right…and a 50% chance I’m either partially or totally wrong. On the flip side, surely there’s a way to for agents and acquisition editors to do a better job with rejections. Yeah, a pre-printed rejection note saying that even though the work was interesting it just didn’t fit our needs may be an innocuous white lie intended to decline without rancor, but neither the writer nor the rejector have been well served. If the writer learns something about real deficiencies in his submission, then there’s a chance revisions will be made that make the next submission that much closer to professional. That’s good news for the agent/editor—the more professional the work they see, the better the quality of the projects they represent/publish. So how about a checklist designed to give sincere feedback, even if it is coming from a harried assistant who’s had only time enough to look at a query letter and five pages of manuscript? It would only take seconds, yet could help both sides. ___ For me, the grammar in the submission did not reach a publishable level. ___ For me, overwriting (too many details/adjectives/adverbs) robs the work of pace and tension. ___ I don’t believe that I can sell this story/topic. ___ I felt the pumpkin was too small for our customers. Send me suggestions for more input items. Let’s put a critique sheet together and post it for agents and editors. Please send your ideas. That's what Ray has to say about rejection. What do you say? As for me, I'm going back to my computer to finish novel number three. I was browsing through the latest edition of Publisher's Lunch (the free edition, of course) and came across this picture taken by Becky Garrison at the recent BEA meeting. 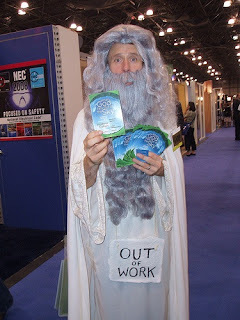 I'm not sure what the book sales pitch was that inspired this guy to dress up like this, but the image of an unemployed God really struck me. I'm old enough to recall the movement decades ago that averred that "God is dead." I didn't believe it then, I don't believe it now. But is He unemployed? Whether we like it or not--whether we believe it or not--God is very much at work in the world. We may or may not pay any attention to Him, but that doesn't mean that He's on an extended vacation. Anne Lamott has written that there are really only two prayers: "Please, please, please" and "Thank you, thank you, thank you." Unfortunately, too many of us limit our prayer life to the former and forget the latter. But when we leave God out of our lives completely, we are saying to Him, "I've relegated you to the unemployment line. I'll take care of this myself. But leave me your contact information, and if I need You, I'll give you a call." God is not dead. God is not even unemployed. He's available on a moment's notice, to comfort us, to inspire us, to direct our paths, to help us in the tough times, to receive our praise. Don't think for even a minute that He's retired from the workforce. Some of my recent postings and interviews have dealt with writers getting help from outside sources: readers, editors, and crit groups. I’m convinced that, with very few exceptions, works of fiction (and non-fiction, for that matter) are not written in a vacuum. Suggestions are made, words changed, sections are rewritten—and generally the resulting product is improved over the original form. But who decides what to keep and what to throw out? Ultimately, the decision belongs to the writer. Let’s play a little game. I’m going to give you the opening lines of a suspense novel on which I’m working. The first version is my first draft. The second is the same material as rewritten (during an encounter at a writers’ workshop) by a well-known author. The third is a sample suggested by a professional editor, Ray Rhamey. In my first scene, I wanted to hook the reader immediately, and it’s apparent to me that both revisions help do just that. As you can see, the author prefers short, punchy sentences in the scene. He wants to interject action, help the reader feel the flow of the work. He likes lots of "white space." The editor had a different idea. Although his version doesn’t exactly match my character’s name and situation, it illustrates setting the scene and involving the reader from the very beginning. My point? Things can always be improved, and there’s more than one way to do it. Take constructive criticism for exactly what it is: a suggestion. Then use the best ideas to rewrite it in your own voice. That’s what I did, but since it’s still a work in progress, you’re going to have to wait to see the final result. "Don't turn around. Keep your mouth shut and don't move a muscle." If the unmistakable prick of a knife against the side of his neck weren't convincing enough, the voice behind him was. The guttural sounds, more spit than spoken, sounded like they issued from a throat that was rinsed each morning with broken glass instead of Scope. Ben's head remained immobile, but his eyes flicked left and right looking for help and finding none. 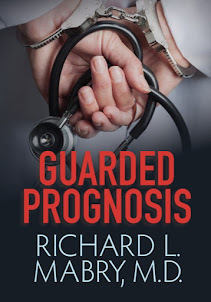 At 2 AM, there were at most a half dozen cars in the area of the doctor's parking garage where he stood, with no other human inhabitants except him and his attacker. It seemed that all his colleagues were asleep, having left Dr. Ben Merrick to deal first with a ruptured appendix, and now with a mugger. If he'd had time to spare, he would have breathed a "Why me?" into the air. As it was, he was having trouble breathing at all, since an arm now encircled his neck, adding near-asphyxiation to the menace posed by the continued pressure of the knife. The guttural voice came from behind him. The prick of a knife against his neck served as punctuation. Ben's body froze, but his eyes darted right and left. Suddenly, he felt an arm around his neck, pulling him back, almost choking him. The pressure increased, cutting off his words. "OK," he managed to whisper, "you win." 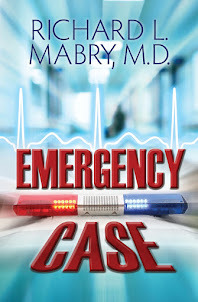 His pulse pounded in his ears, almost drowning out the attacker's next words. "We hear you don't want to cooperate. This is to convince you." Three vicious blows rained onto his kidneys. Ben's cry of pain echoed through the darkness of the hospital’s empty parking garage. He slumped forward. The restraining arm brought him up short, cutting off his air. 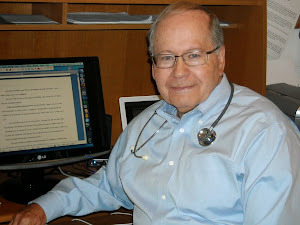 Dr. Ben Cooper pulled his car keys from his pocket, glad for the quiet of the hospital parking garage at three a.m. after a night of cries and screams in the emergency room. The teddy bear he'd bought for Becky grinned up at him from the passenger seat, and he smiled at the thought of how much she'd love it. Then a hand flashed in front of his face, steel glittered, and a sharp line of pain pressed against his throat. Now, how would you have written the opening? I hope this illustrates for you that there are many different ways to write the same thing. That's why editors assure neophyte writers that no one is going to "steal their ideas." Plot is one thing. 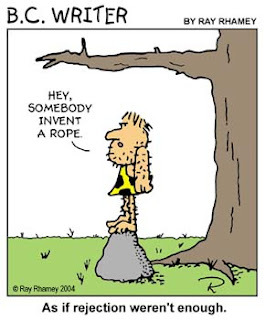 Execution is another--and I think it's much more important than any single "idea."